In A Red Boyhood -- Growing up Under Stalin, we followed a child's perilous journey of survival through war-torn Eastern Europe, Nazi occupation and, as the son of an "enemy of the state" Soviet repression. What happened to that boy, his brave and resolute mother, and his little brother at war's end? 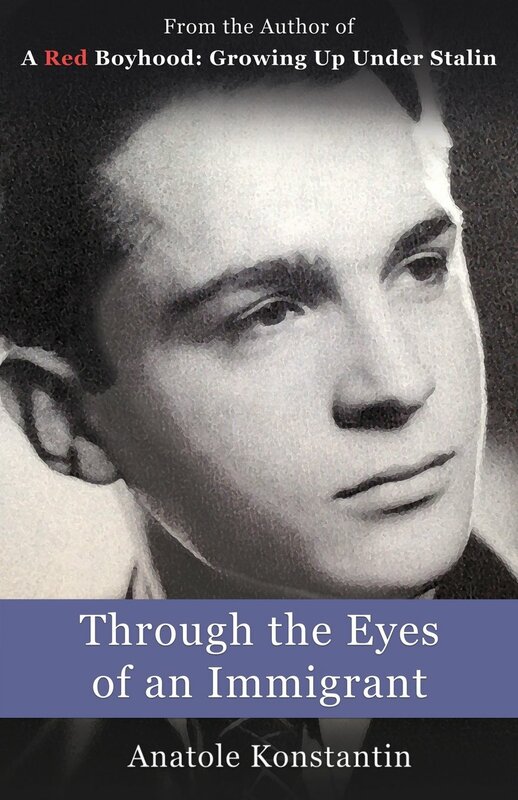 Now, the journey continues with Anatole Konstantin's love letter to America in his new memoir, Through the Eyes of an Immigrant. As a "displaced person," young Anatole arrives in New York in 1949 in pursuit of achieving the American Dream. Often elusive though that dream may be, we cheer as he overcomes, with humor and optimism, the obstacles and challenges of assimilation. Through his personal experience of having endured the harsh realities of living in a totalitarian state, we see mid-century world and American events through his discerning observations to gain new understanding of how Soviet propaganda ensnared a generation of American intellectuals to becoming sympathetic to the cause of Communism. With an array of characters, Through the Eyes of an Immigrant will have you laughing, and at times, marveling at how a young man's persistence, talent, hard work, love of family and a little bit of luck can make a dream come true."